The Hakka 8 has continued its undefeated reign as top winter tire for the fourth year in a row. But for the first time it is not alone in that position, tying the Continental ContIceContact 2. It achieved its position primarily through excellent ice performance. 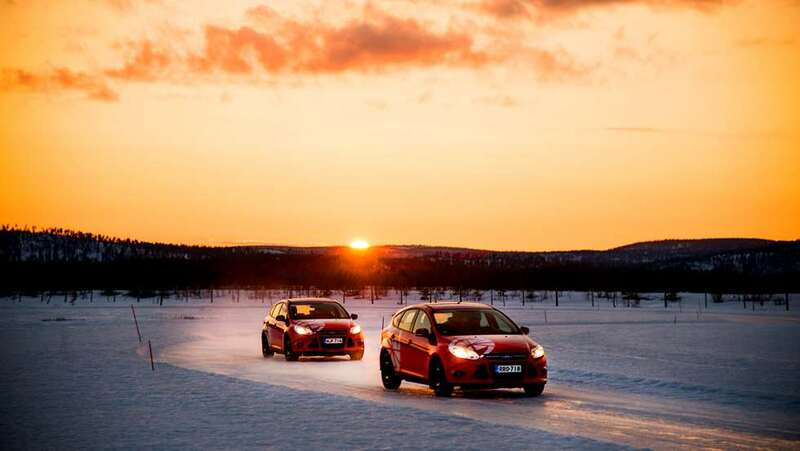 It had the shortest ice braking distance in the test and the highest rating for driving feel on ice. It placed third in ice acceleration and ice course lap time. In all other conditions – snow, wet, dry – it was a competent performer. The only serious drawback is its high noise rating. It was one of the loudest tires in the test. 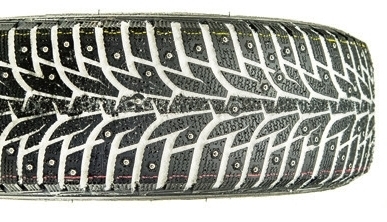 Those prioritizing a quiet highway ride may want to steer clear of this heavily-studded tire. The Hakka 8 is exclusive to Kal Tire in Western Canada. Stud count: 190. Country of manufacture: Finland. The premium Nordic winter tires featured in this test from Continental, Bridgestone, Goodyear, and Michelin are not available in North America. We will focus only on the tires that are available here in Canada. Stud count: 190. Country of manufacture: Germany. The Pirelli Ice Zero performed well again, following its second place finishes in 2013 and 2014 – and somewhat disappointing fifth place finish in 2015 – with a fourth place result. As before, it scored very close to the top tires ahead of it, with good ice performance and excellent wet performance, along with competent snow and dry performance. It stood alone as the best tire for accelerating on ice, and had the fourth shortest braking distance on ice. It was also the top performer on the wet course and provided the third shortest wet braking distance. The only category where it performed poorly is rolling resistance (see note at end of article on rolling resistance). It even tied the Gislaved for quietest studded tire, though that result seems questionable, as it has been one of the noisiest tires in each of the three previous NAF tests. The Ice Zero is available in Canada through PMC Tire and your local Pirelli dealer. Stud count: 130. Country of manufacture: Russia. The Hankook Winter I*Pike RS W419 impressed again, scoring close to the top tires overall on the strength of respectable ice performance and outstanding snow performance. This was the best pure snow tire, topping the chart for both braking and accelerating in snow, with the second fastest snow course lap time. Competent in all other areas, it’s only serious weakness is road noise. It equaled the Hakka8 as one of the loudest tires. While the I*Pike RS W419 is available in Canada, it does not yet appear to be available in factory-studded form. The ice performance of a hand-studded version would not be expected to be as good on ice as the examples in this test. It is available in Canada through PMC Tire and your local Hankook dealer. Stud count: 170. Country of manufacture: South Korea. Stud count: 130. Country of manufacture: Poland. The introduction of the Gislaved Nord Frost 200 was highly anticipated, but turned out to be somewhat of a disappointment. It was unable to match the performance of the original ContiIceContact on which it was based, but like the 100 it is still a solid performer. Its primary weakness is its ice performance, where it was dramatically outperformed by top tires such as the Hakka 8. 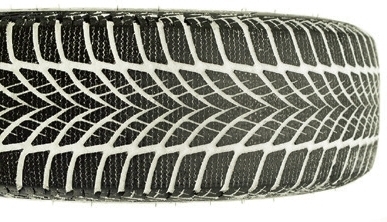 It trailed all other studded tires this year in ice braking, but none of the studless tires. Given the excellent ice performance of the original ContiIceContact in previous NAF tests, the result is surprising. Either Gislaved’s “tristar” studs are inferior to Continental’s Brilliant Plus “dog bone” studs, or a harder rubber compound was used. Regardless, this is a competent tire in all conditions and one of the better tires on wet asphalt. Its greatest attribute may be its relative quietness though. 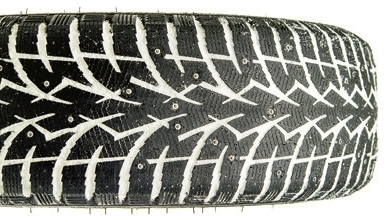 It tied the Pirelli as the quietest studded tire in the test, and the previous generation of Gislaved tire – the Nord Frost 100, which used the same stud design – was among the quietest studded tires in all previous NAF tests. That may make this tire especially desirable to many drivers. The Nord Frost 200 can be purchased in Canada in factory-studded form through PMC Tire and your local Gislaved dealer. Stud count: 130. Country of manufacture: Germany. Stud count: 96. Country of manufacture: Russia. The Toyo Observe G3 Ice made its debut in the 2016 NAF test with a mediocre performance. 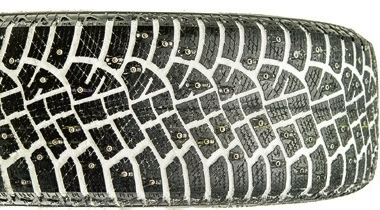 It placed near the bottom for studded tires in all ice and snow categories, and had middling results on wet asphalt. It shone on dry pavement though, with the best braking performance of all the studded tires. 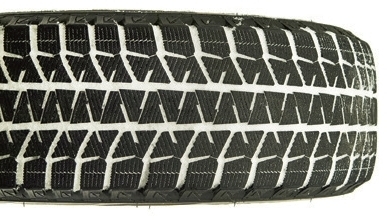 This is a tire that will get you through the winter safely, but don’t expect anything spectacular from it. 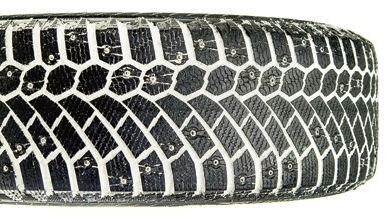 The Observe G3 Ice is available in factory studded form in Canada. 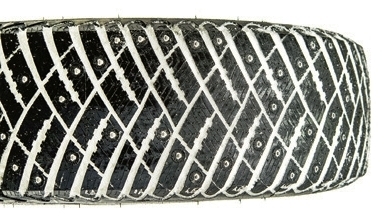 However, it is also available as a studdable tire, so it could also be sold as a hand-studded version. 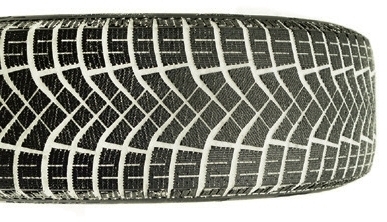 Toyo’s webpage for the tire provides no detail on the design of the stud. It can be purchased in Canada through PMC Tire and your local Kumho dealer. Stud count: 97. Country of manufacture: Malaysia. 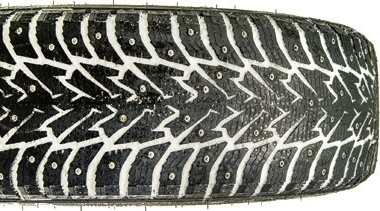 Kumho’s Wintercraft Ice Wi31 also made its NAF test debut, with a tread design resembling that of the Hakka 8. But that’s where the similarity ends. 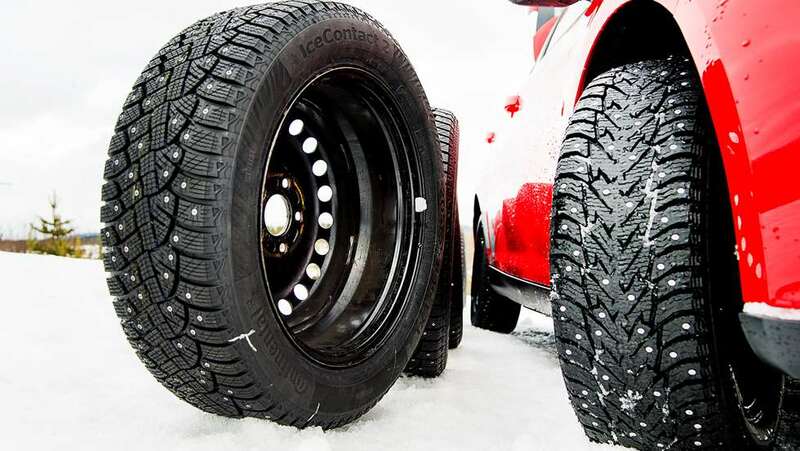 It provided the slowest acceleration on ice of all the studded tires, and lagged well behind them on the ice course, coming in a whopping 3.8 seconds slower than the next slowest studded tire: the Toyo. That’s a greater spread than that covering the other nine studded tires in the test. It was also the worst performer in snow testing, with the slowest acceleration and snow course time, along with the slowest time through the wet course. Additionally, it scored the highest rolling resistance. Against this impressive collection of competitors, the Kumho falls behind in most areas. But the competition here is stiff, and regardless of the rankings this is a competent winter tire that would impress anyone lacking experience driving the top studded winter tires of the past decade. Kumho’s webpage for the tire appears to suggest that it uses their own “turbine” stud design. However, like the Toyo, availability of the factory-studded version is questionable and it is available as a studdable tire. It can be purchased in Canada through PMC Tire and your local Kumho dealer. Stud count: 150. Country of manufacture: South Korea. While SSTC does not endorse studless winter tires, we understand that some drivers might prefer the quieter ride, or have other reasons that they cannot use studded tires, such as parking garage bans. Maybe we even have some readers from Ontario, where studded tires are prohibited. 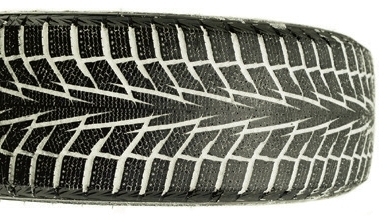 For those drivers, a studless winter tire is a much better option than an all-season tire. Unlike the drivers of studded tires, who never have any concerns about winter grip or traction, they simply need to drive very carefully in certain situations where wet ice may be present. For those drivers, let’s take a quick look at the results of the studless tire testing. No surprise that the top tires in the test are from some of the most respected tire manufacturers in the industry: Continental, Nokian, Goodyear, Michelin, and Bridgestone. Sava and Hankook also put in respectable performances. They all achieved their places in the rankings primarily through their strong performance on ice. 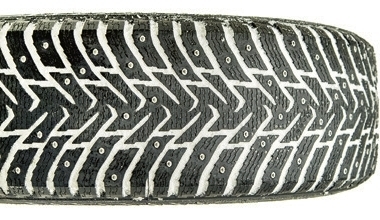 While they cannot compete with the studded tires in this category – unless only cold, rough ice is used – they still do an impressive job considering the lack of studs. The top tire on ice was the Michelin X-Ice, which stopped 22.2 meters shorter from only 50 km/hr than the Continental winter-rated performance tire that was used for comparison, and 14.5 meters shorter than the worst serious winter tire in that category: the Pirelli Ice Zero FR. 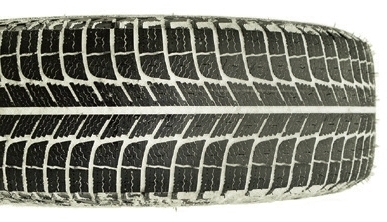 An all-season tire would be expected to perform much worse than even the performance winter tire. While the Michelin performed best in straight-line testing, the Continental and Nokian demonstrated a considerable advantage in lateral ice grip, besting the Michelin by three seconds or more on the ice course lap. In snow the differences are much less pronounced. 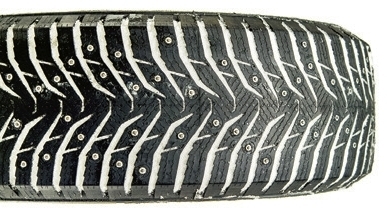 The studded tires outperformed the studless tires on this surface due to the more aggressive, widely-spaced tread patterns that can be used when the especially soft and heavily-siped tread area of the studless tires are rendered unnecessary for ice through the use of studs. But all the studless winter tires still performed competently on snow. The best was the Nokian R2, which topped all studless snow categories and was able to brake from 80 km/hr in 7.9 meters less distance than the reference Continental performance winter tire. On wet asphalt, the studded tires led the way, as usual, with shorter braking distances and wet course lap times. But there was one exception: the Landsail. 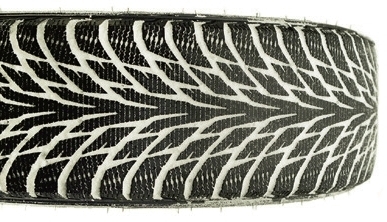 The Landsail’s weak performance on ice and snow shows that it is more like an all-season tire in terms of tread design and rubber compound compared to the top winter tires, which are softer and more heavily siped. 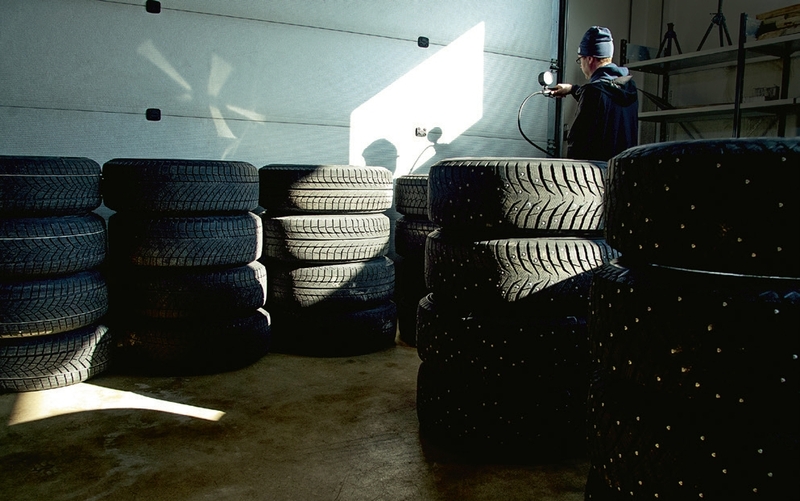 But winter tires are purchased to deal with the worst winter conditions, not the easiest ones. The Continental performance winter tire demonstrated what an even less winter-oriented tire can do by easily outperforming the Landsail and all the other tires in the wet and dry testing. Of the more serious studless winter tires, the Goodyear demonstrated superior wet performance by a considerable margin. All the serious winter tires posted comparable results in dry testing, with the studless tires generally having a slight edge over the studded ones. The big surprise in the studless category this year came from Pirelli. Its Ice Zero FR placed well behind the top tires in 8th, with only 6.7 points, due primarily to poor ice performance. It was outperformed on ice even by the inexpensive Chinese tires: the Landsail and Nankang. It’s a curious result, given that the Ice Zero R tied for second place with the Michelin and Goodyear at 7.6 points in the 2015 test. 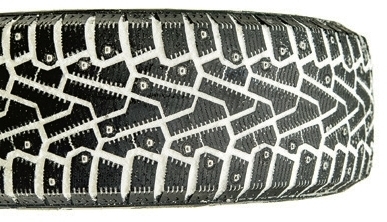 Visually, the two variations of the studless Ice Zero appear to have the same tread pattern, so we can only speculate that there may have been a change in the rubber compound. Note that the Continental Conti Viking Contact 6 is not not sold in North America, but appears to be comparable to the Extreme Winter Contact. 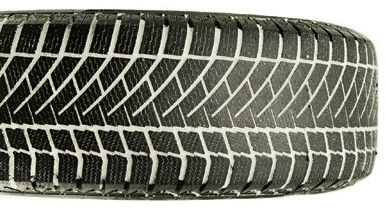 The performance winter tire is not specified but is likely comparable to the ContiWinterContact series. Testing was performed using a current generation Ford Focus on 205/55R16 tires. While the NAF site provides easy access to the final rankings, there is very little test data published on their site this year, unlike previous years. For the complete data, you must decipher their registration procedure and download the pdf of the magazine. It’s not difficult, but it does require a fair bit of translation to get anything out of it. So we have chosen to include the full test data in our report this year. The rolling resistance is determined by measuring the time for the vehicle to coast down from 80 km/hr to 40 km/hr in the absence of any wind. 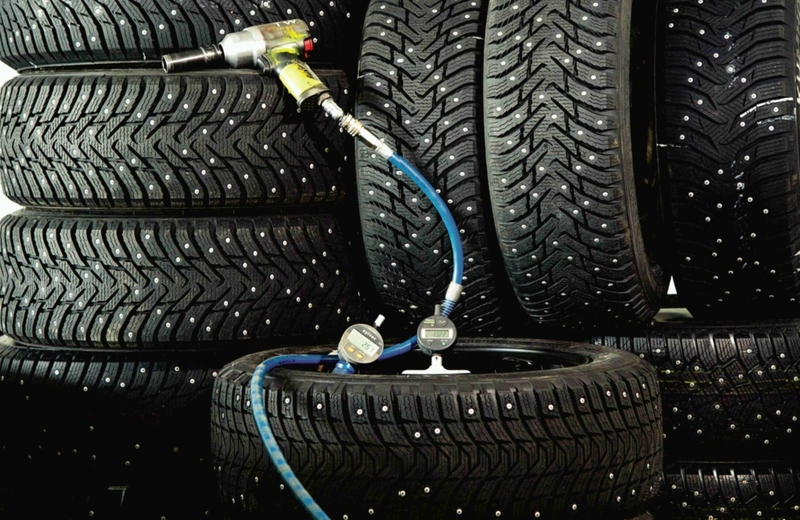 It is done twice for each set of tires, at two different temperatures. The values are then converted into an estimated increase in fuel consumption relative to the tire with the least rolling resistance. The spread in fuel economy difference is only 2.9% between the best and the worst performer in this test. While those numbers don’t tell us much, we can easily estimate the relevance of this difference in terms of fuel consumption and its associated cost. For our estimate, we will assume that the tire life is 60,000 km, and that the vehicle normally averages 10 l/100km in fuel consumption. At $1 per liter for fuel, the additional operating cost over the life of each set of tires can be determined. 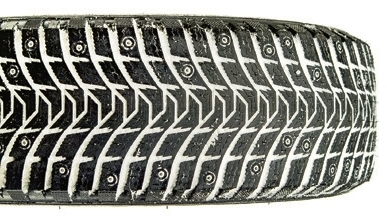 Given that the typical cost of a set of good winter tires is, after installation and taxes, often $800 or more, these differences in fuel economy are significant, but not terribly so, especially considering that we lack any information about the other important element of a tire’s operating cost: its tread life. Because of that, and the fact that the results are already included as part of the tire scoring system, SSTC does not recommend putting additional value in the rolling resistance numbers alone. When you’re consuming $6000 in fuel and just as much or more worth of resources through vehicle depreciation, maintenance, and insurance, an extra $100 is environmentally insignificant. Driving an automobile is not an environmentally friendly activity under any circumstance, especially if it involves personal harm or destruction of property. Choose the available tire that will best meet your needs instead to enjoy driving and stay safe on the roads this winter.